Spark has just released details of how to access its beta sports streaming service from today. 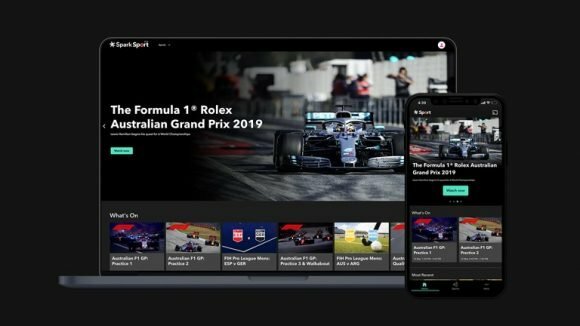 Spark Sport is now live this morning in beta; Kiwis can watch live and on demand sport on the service, in time for the Australian Formula 1 Grand Prix. The sport streaming service is available directly from the web, and on Android and Apple devices. Kiwis can sign up for a 30 day free trial during March and watch the Formula 1, World Rally Championships, FIH Pro Hockey and NBA TV, with more content arriving in the weeks to come. ONE Championship and EDGEsport have also been added to the line-up of sports offered. Head to www.sparksport.co.nz to get started. Spark Sport is now live at www.sparksport.co.nz in time for the Australian Formula 1 Grand Prix. Sports fans will be able to jump online to register for a 30 day free trial of the service and road test Spark Sport, catching live action or on demand coverage for a range of upcoming events. They will also be able to access replays, highlights and 24/7 TV channels. The service has launching in beta, which means that the core functionality is working, but improvements and additional features are still being added. In addition to going live on Apple and web as promised earlier this week, Spark Sport is also available as an Android app, in time for the Australian Grand Prix. In the first few months of the service, there will be hundreds of hours of live and on demand content to enjoy. Spark Sport is kicking into gear with an exciting line up of events, including the first Formula 1 of the season (Australian Grand Prix, 14-17 March), the Corsica World Rally Championship (28-31 March), NBA TV (6-7 games per week, 3 of which are live) and FIH Pro League hockey matches (fixtures every few days, next Black Sticks matches on 17 March). As the new sports streaming service goes live, Spark Sport is also announcing two exciting new additions to the platform. Spark Sport will be the home of ONE Championship, one of the world’s largest martial arts organisations. ONE Championship features bouts across the full spectrum of martial arts such as Muay Thai, Kickboxing, Mixed Martial Arts (MMA), Karate and more. MMA enthusiasts can catch the next event, ONE Hero, from Spark Sport on 25 March. Spark Sport is also welcoming EDGEsport, its first 24/7 action sport channel, to the platform. EDGEsport offers live action and premium content from the adventure and action sports world across a wide array of sports, including skiing, snowboarding, biking, surfing, skating, motorsports and many more action sports. Fans will be able to watch live sporting events in real time. They can pause at any point and ‘rewind’ up to 4 hours. Once a live event finishes, it will be available later on demand. TV channels on Spark Sport can also be live paused and rewound up to 4 hours. Spark Sport is now available as an app on selected iPads and iPhones, Android devices, AirPlay to Apple TV, Chromecast and all popular web browsers. During the months following launch, the Spark Sport app will become available on Apple TV, Samsung, Panasonic, LG and Sony Smart TVs and further platforms still to be announced. Spark Sport will stream in HD when the data connection and device supports this. If the connection is slower, Spark Sport will automatically adjust to a lower video quality to ensure a consistent viewing experience. 2. Download and log in to the app to your iPad/ iPhone/ Android device OR open Spark Sport in an internet browser on a laptop or desktop computer. 3. Use Chromecast to send the content to any internet enabled TV OR use AirPlay to mirror Spark Sport on any TV with Apple TV set up – and start watching! 2. Download and log into the app on your iPad/ iPhone/ Android device, or open Spark Sport on a browser of a laptop or desktop computer – and start watching! All the details on how to get started on Spark Sport, including a welcome to Spark Sport from Scotty Stevenson, are available on the Spark Sport help site. As Spark Sport has launched in beta, the Spark Sport team will be in listening mode. If there’s something you think we should know, we welcome questions and feedback. Image and demo video available here. I note that Duke’s primetime coverage on Sunday night managed a 6.4% share of the TV audience for M18-49. Can you please help quantify how many people watched the Melbourne F1 FTA coverage – in addition to the 9,000 people that watched it streamed on SparkSport?